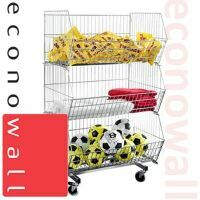 We have a fantastic range of retail basket style display units all available from stock ready for fast delivery. All made from high quality steel, this is one of our most popular ranges as they can be used to display almost anything from fresh produce to clearance stock. Great for grocery shops, music shops, pet shops, stationary shop, clothing shops.... in fact we cant think of a single shop that couldnt use one of basket units. Our range of Basket Display Units are small enough items to allow us to deliver them by parcel carrier. Delivery for 1-3 boxes will be handled by parcel carrier, orders larger than 3 boxes will require a small pallet delivery. 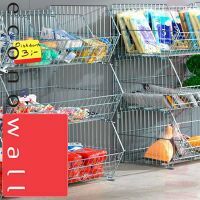 If you are ordering your Basket Display Stands at the same time as larger items that require pallet delivery, then to save you money, we will include them on that delivery for you rather than charge you for a seperate delivery. Delivery costs for 1-3 boxes is a parcel rate of £16.50 for most UK delivery areas. 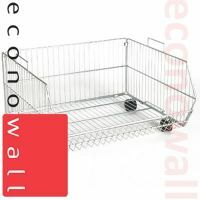 For more than 3 boxes or non mainland delivery areas, please add all the items you require to the shopping basket, click on view basket and you can easily calculate your personal delivery cost from there.